Alexis Sanchez's delightful double along with Mesut Ozil's strike helped Arsenal to their biggest victory over Manchester United since 1998 to make an astronomical statement at the Emirates. The Chilean continued his patch of fantastic form, flicking it past David de Gea, just a minute before Mesut Ozil stroked it down the centre when set up by Theo Walcott. They wouldn't be done there though, because Sanchez would let fly from the edge of the area, leaving the keeper no chance of stopping as it raced into the top corner—and there would be no return for Van Gaal's men after. Anthony Martial tried his very best to bring his team back into the game, but at the hands of Petr Cech's world-class goalkeeping, and some resolute defensive displays, the Gunners took all the points with a clean sheet. Straight from the whistle, Arsenal looked the stronger team, holding possession easily before breaking forward and earning a free-kick on the left channel, of which was subsequently beaten away by David de Gea. Their chances continued to flow; crosses came in and they were knocking on the door in the first few minutes. Soon enough, they'd find what they were looking for in shorter time than most expected. 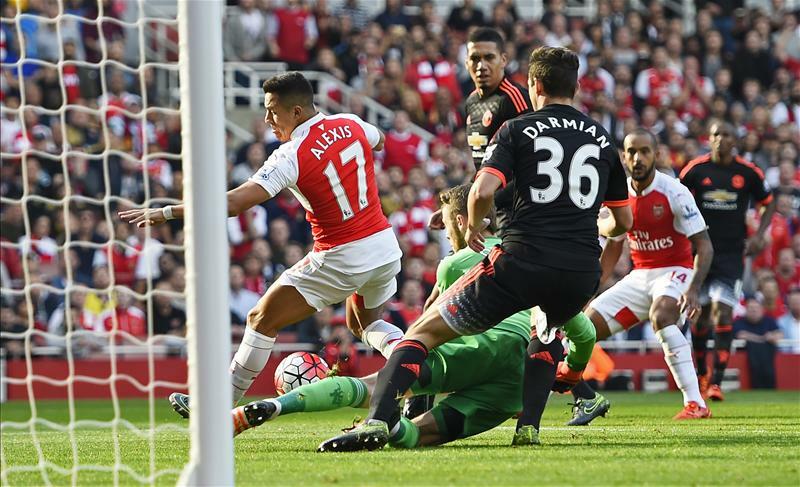 Alexis Sanchez finished off a swift move worked to perfection by the hosts, ending with Ozil playing a one-two and guiding it towards Sanchez at the near post who heel flicked it into the net. There was close to no recovery time for Manchester United, either, as Mesut Ozil was in ample space in the middle of the area and placed it right into goal after Walcott beat the offside trap and cut in. Manchester United were devastated, the world was shocked, while Arsenal were absolutely flying. In an attempt to salvage their dignity, United did all they could to get the smallest of grasps on the game, and they soon enough managed—passing it round in restricted space from the suffocating Gunners' pressure. Just as they did begin to get their wits about them, Alexis Sanchez unleashed a world-class sequence of play to sink the hearts of the visitors. Picking up the ball outside the area, he cut in on to his right, waltzed past two defenders and then let fly with a bullet into the top right corner. Attempts continued to rack up for the North Londoners while the stats were barren for Manchester United, well the good ones at least. Aaron Ramsey could have made it four when he missed a close chance, while Walcott didn't test de Gea by dragging his shot wide soon after. When Manchester United actually managed to materialise an attack, it was impressive. But what was even more impressive was the reflexes of Petr Cech, sticking a foot out to deny Anthony Martial after the Frenchman overpowered a defender, and turned when the ball was bouncing to fire towards goal. That stop was crucial, for it restricted the Red Devils from gaining momentum. To prevent further instances the hosts continued to push the pace, but Martial continued to be the spark that could change things, wining a corner only for Mertesacker to head Young's delivery away. 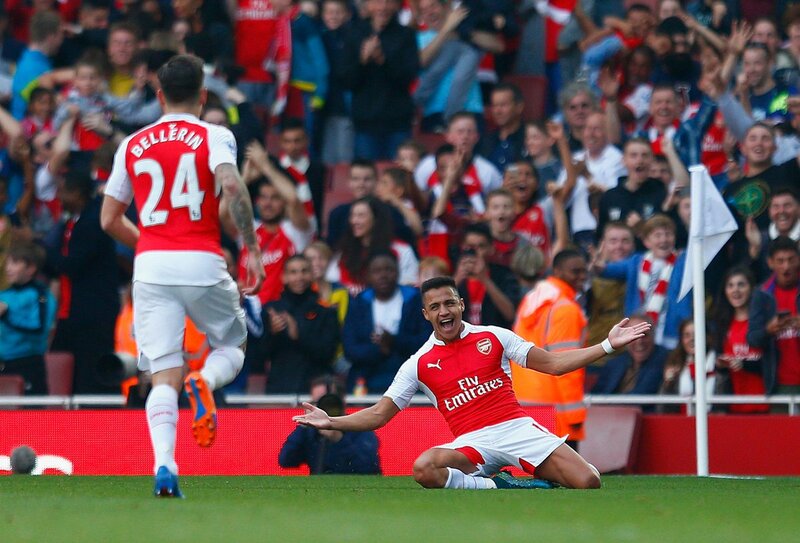 A theme of the game was Arsenal's unveiling of their new-found counter attacking abilities. While it didn't lead to much, Alexis epitomised this when his long ball found Ozil in the attacking third after dealing with a corner. Even with concentration down, Arsenal managed to keep a clean sheet—be it through Cech's reliable catches or Mertesacker's constant clearances. Manchester United were beaten, and with the fans heading for the early exits they had been dealt a big blow. Alex Oxlade-Chamberlain certainly deserved a goal in the dying moments of the match when his lob rattled the woodwork, and the full-time whistle would soon come, confirming what had been an inevitability from the first few moments of the match: Arsenal won, and they won convincingly. 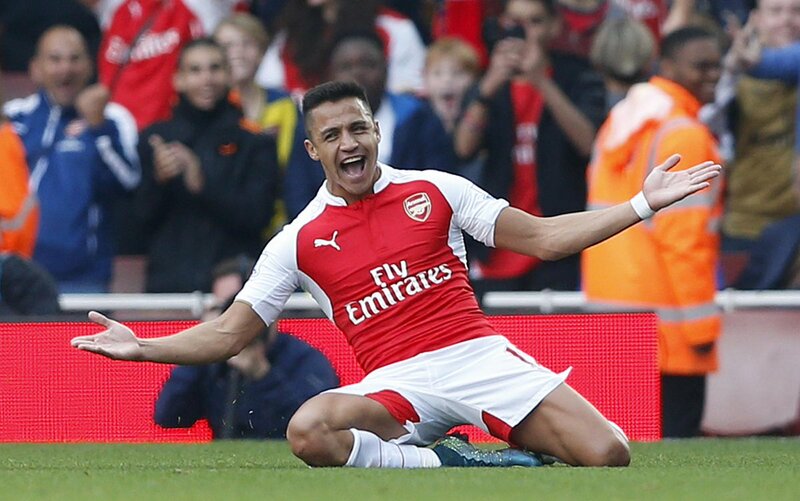 Alexis Sanchez's delightful double along with Mesut Ozil's strike helped Arsenal to a resounding victory over Manchester United to make an astronomical statement at the Emirates.